Your processes (visioning, creating change teams, boring PowerPoint presentations, etc) alone are not effective in creating change. Meetings and processes can be part of a communication strategy if designed carefully, but they aren’t enough to meet change communication needs alone. Make following up with answers and updated information a top priority. Communicating change is uncomfortable. Change can be scary and adapting to change is often complex and messy. Tasks are easy to list, but behaviour and long-held habits are not always so easy to change. Gain isight and perspective from outside your organisation and adapt your approach to fit your organisation. Be clear. Clarify what is changing and why. Too often programs are jargon heavy and are missing the substance and impact of what the impact of the change is in the day-to-day reality of the organisation. Clarify the jargon. What is the specific call to action? Get help. 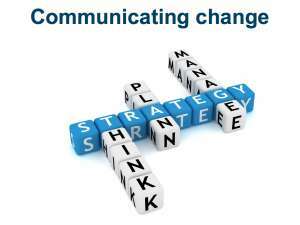 Utilise the expertise of communication strategists from the start. 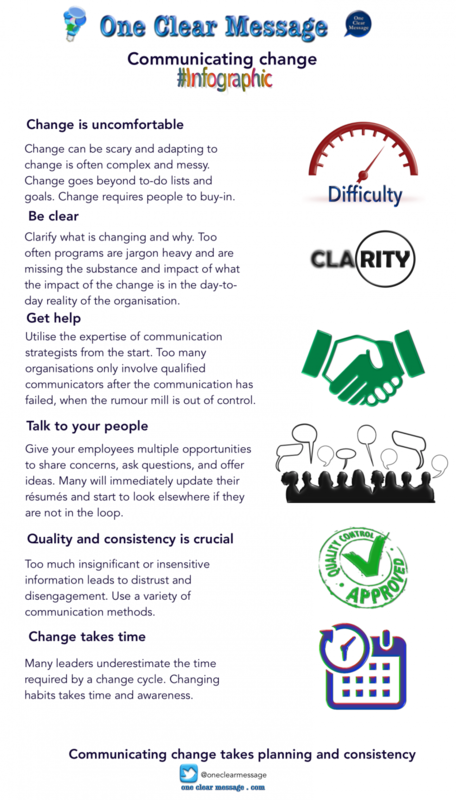 Too many organisations only involve qualified communicators after the communication has failed, when the rumour mill is out of control. Talk to your people. Share information with your employees as soon as possible so they don’t hear about a merger or reorganisation on their car radio. Once fear sets in you will waste a lot of time and money regaining their confidence. Many will immediately update their résumés and start to look elsewhere if they are not in the loop. Give your employees multiple opportunities to share concerns, ask questions, and offer ideas. Quality and consistency is crucial when communicating change. Too much insignificant or insensitive information leads to distrust and disengagement. Use a variety of communication methods (just using e-mail or the company intranet site is ineffective and often confusing). Repetition of your core message is helpful in creating an effective communication program. Change takes time. Change starts with the announcement of the change initiative or project and continues until the ingrained habits have become new healthier habits. Many leaders underestimate the time required by a change cycle. Changing habits takes time and awareness.